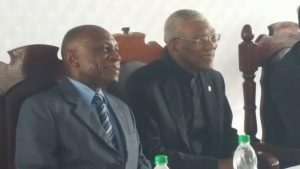 Foreign Minister, Carl Greenidge and President David Granger. President David Granger will not be attending the upcoming summit of Caribbean Community (Caricom) leaders. “The Guyanese Head of State regrets his absence at the meeting but has opted to remain in Guyana to focus on domestic issues at this time,” the Ministry of the Presidency said Saturday. The Inter-sessional meeting is being hosted in Haiti from Monday, February 26 to Tuesday, February 27, 2018. Guyana’s three member delegation to the meeting will be led by Minister of Foreign Affairs, Mr. Carl Greenidge, who is also performing the duties of Prime Minister. The President’s decision not to attend the Caricom summit comes at a time when he is busy visiting communities near the border with Venezuela. The Guyana Defence Force has also deployed additional troops to a number for border communities to pay attention to internal and external domestic threats. Venezuela has virtually rejected the Umited Nations Secretary General’s referral of the border controversy with Guyana to the International Court of Justice.